The weekend is almost here. Anyone have any cool plans? Me and Tim are having some friends over for dinner on Sunday, and I decided to test some appetizer recipes beforehand because, you know, I’m a perfectionist (to the point that I barely enjoy my dinner parties because I’m always running around making sure everything is perfect!). Instead of doing what I usually do – which is calling my grandma – I called my mom (or more like messaged her on Facebook!) 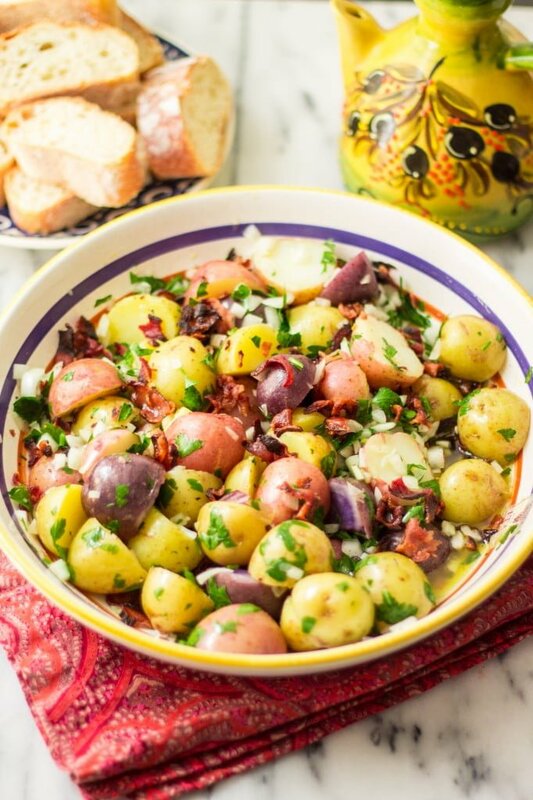 because she has this amazing Baby Potato Salad recipe that she serves as an appetizer in dinner parties. It is always a success! Back at home, with all my ingredients (plus some more! ), I looked at my mom’s instructions for the salad and realized she just gave me an ingredient list. When I asked her about quantities, she says: “Oh, as much as you’d like!”. So I pretty much had to create my own recipe. Since it was now my recipe, I decided I would add crumbled bacon to the salad and bacon drippings to the vinaigrette, something my mom would never do since she’s a vegetarian! :) Oh well, mom is hundreds of miles away in Brazil, so bacon it is! Yes! 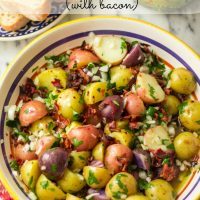 Colorful potato salad + bacon! What could possibly be better? Hmmm, maybe my apartment magically cleaning itself! God, wouldn’t that be nice? 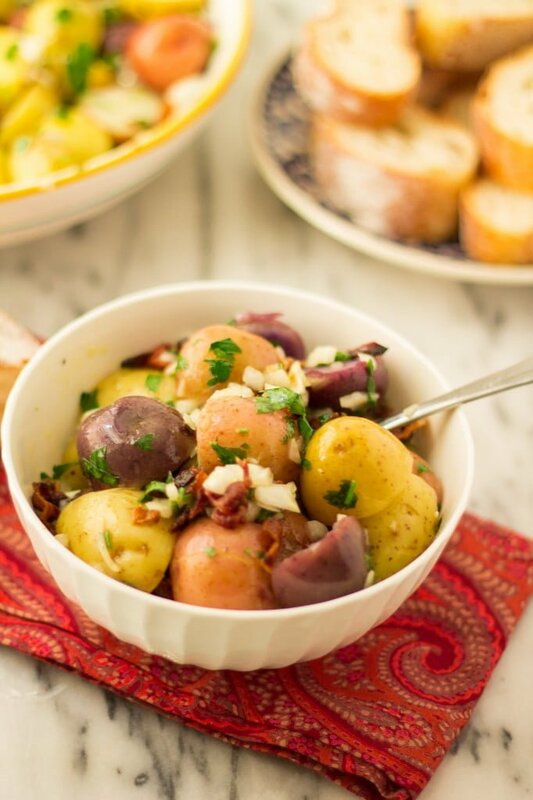 But, back to what makes me happy: easy recipe for potato salad! You guys know how much I love easy/quick recipes. Especially when they taste like you spent hours in the kitchen!!! I made this salad in less than half an hour (including the time it took to cook the baby potatoes) and we had it for lunch and it was very very tasty! It can definitely be served as an appetizer (that I promise will be very popular among your guests) or even as a meal on its own. I ate this at 2pm and only got hungry again when I got home from work, at 11pm! Talk about power food! Yeah yeah! 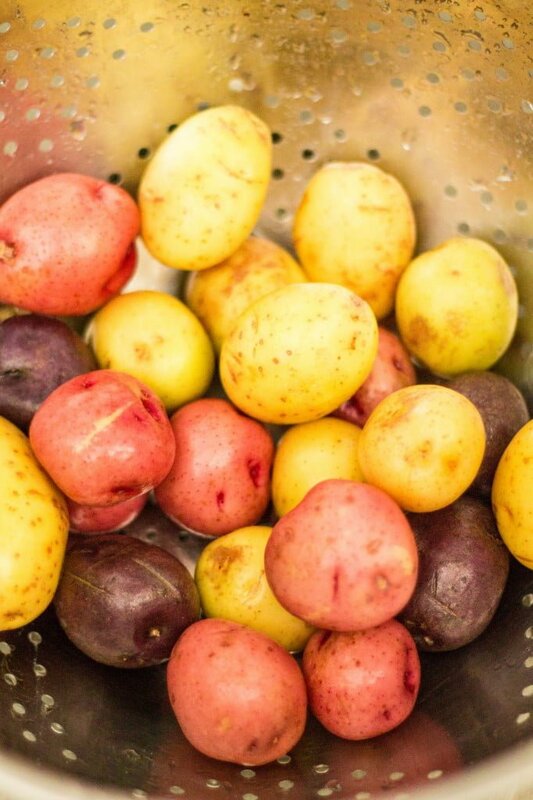 In a large pot, cover the baby potatoes with cold water and salt and bring it to a boil over high heat. Cook the baby potatoes until fork tender but not too soft. While the potatoes are cooking, combine the vinegar, the olive oil, the sugar, the salt and the pepper in a small bowl and whisk them together. Add the bacon drippings and continue whisking. Reserve. When the baby potatoes are cooked, drain them and let them cool for a few minutes. Cut the baby potatoes in half and, with a fork, make some holes in the potatoes so they can absorb the dressing. In a medium bowl, mix the baby potatoes, the onion and the parsley. Add the dressing and give everything a good mix. 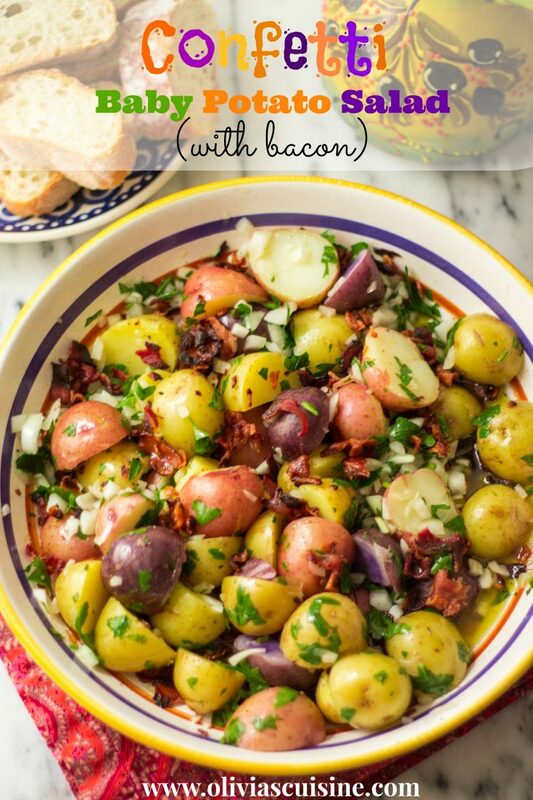 Sprinkle the crumbled bacon over your baby potato salad and serve it with some bread (and some extra olive oil on the side) while it's still warm.